Ask any child about their “dream career” and you’ll instantly know their passion. My six-year-old daughter, for example, believes she’s destined to work as a “pet doctor” because she’s enamored with all animals from squirrels to kangaroos. And my four-year-old? She’s going to be a princess, she says, for no other reason than she watches them on TV. That’s all fine and dandy for now, but as they age, we will gather to have “the talk” – the conversation where I tell them that life isn’t all granola bars and pony rides, and that their career choice will inevitably come with consequences. I want them to follow their dreams, yes, but I hope to guide them towards a “dream life” and not just a dream career. And it’s quite possible that dream life won’t look anything like they think it will. Spend two years in community college. Pursue a degree that can lead to a lucrative career. Pursue your “passion” in your spare time. Decide if college even makes sense. You have the power to pay off your student loans, so do it. Consider refinancing your loans if it makes financial sense. Although I mostly write about personal finance, my other niche topics are travel and higher education. As a writer who covers everything from the growing costs of college to the intricacies of specific degree programs, I am constantly shocked by the details I uncover. Fact: Indebted graduates from the class of 2015 left college with more than $35,000 in student loan debt. Fact: Tuition at for-profit schools can cost more than tuition at Harvard – even to earn an Associate’s degree! Fact: National student loan debt levels recently surged to $1.3 trillion dollars, a figure that increases $2,726 every second. A lot of the stuff I read and write about is downright cray – from students who borrow $100,000 for bachelor’s degrees to for-profit colleges that close their doors and leave their students out in the cold. Even crazier is the fact that much of it could be completely avoided if kids – and their parents – took the time to consider what borrowing money for college really means. Sadly, we’re often too busy telling our kids to “follow their dreams” to take a cold, hard look at the aftermath of following such advice. And the results are nothing short of devastating for millions of borrowers who owe so much money they worry they can never pay it back. My kids are only 6 and 4 now, but they’re going to hear an ear full when they get older. While I truly hope they find meaning in their lives, I will implore them to consider how they want their lives to look five, ten, and even twenty years from now. I do plan to pay for my children’s college education in full, but that doesn’t mean I want them to squander the opportunity – nor does it mean that I’m offering a blank check. While earning a four-year degree might be the best move for your career, earning the bulk of your initial credits at a community college is a great way to save money. Tuition at our local community college is only around $4,000 per year, whereas tuition at the local four-year schools starts at $9,000. If the numbers stack up similarly in your area, spending those first two years at community college could save thousands of dollars over the duration of your school career. And since your final degree will come from the four-year school you graduate from, it’s likely no one will even know you went to community college for a while. See also: Should Parents Have a Say in Their Child’s Choice of College Major? After my husband graduated from college with a degree in theater arts, he found his “degree” wouldn’t actually land him a career as an actor; that was something he needed to do on his own. Of course, that doesn’t matter to loan servicing companies like FedLoan and Great Lakes, nor should it. They’re there to collect the payments you promised them. Looking back, my husband now says pursuing a degree in theatre was an awful idea – and a poor use of his college funds. In fact, during his first week in class, he says even his professor told him he was wasting his money. If only he would have listened! Pursuing your “dream degree” may sound smart, but that doesn’t mean it will actually help you get a job. Most of the time, the artists with the most talent will succeed with or without a college degree. And if you pursue a degree in a profession that will likely lead to employment, you can continue pursuing your dreams and artistic talents on the side. “But what about my dreeeeeeeeeeeeeeeeeeeeeeams?” is the question everyone is asking. Here’s the cool thing: When you pursue a degree that leads to a lucrative career, you’ll have the money to pursue your hobby or passion in your spare time. In a perfect world, I would earn a degree in “taking beach vacations.” Maybe I could even get the school to call it something fancy like “B.A. in Creative Relaxation.” Wouldn’t that be grand? Sadly, we don’t live in a perfect world, and no one is going to pay me to get day-drunk and look for hermit crabs. Fortunately, I earn enough money I can pursue this passion of mine in my spare time. See how that works? Whether you love creating art out of shoes, indie music, or making YouTube videos, earning a degree in an in-demand and high-paying field will make it easier to pursue your passion in your spare time. While a college degree pays off for the majority of students, there are some people who simply don’t need a college degree to succeed. Maybe you have an epic business idea and would rather put your energy into getting it off the ground. Or perhaps you are crazy-talented in some skill or trade where a college degree wouldn’t benefit you much at all. Regardless, the growing costs of higher education make it important for everyone to stop and think about whether college is the right move. Giving good college advice means considering that college – particularly four-year schools – might not be the best option. There are oodles of excellent jobs that only require a two-year degree or professional certificate. Many, many people go on to become a huge success without that plaque on the wall – and without the crushing student loan debt that often comes with it. Greg went on a huge rant about student loan forgiveness a few years ago, and I believe the central message of his diatribe still rings true. Basically, he feels like most people who borrowed money for college should buckle down and repay their loans as quickly as possible instead of signing up for loan forgiveness programs that garish your wages for the next 20-25 years. I mostly agree. Average student loan debt is around $35,000, which is basically the price of a brand new car. If you forgo the new car for the next decade and drive a piece of crap instead, you could take the money you would normally pay and absolutely kill your student loans. Of course, that only works if you stop complaining long enough to do the math. Over the last five years, a number of innovative companies have stepped forward to offer a solution that works for some student loan borrowers – student loan refinancing. Just like you can refinance the loan on your home, you may be able to move your current student loans into a product with a lower interest rate and better terms. If you refinance federal loans with a private lender, you will lose certain protections including deferment and forbearance, along with access to income-driven and public service forgiveness programs. Still, this strategy can make a whole lot of sense for anyone who doesn’t plan to take advantage of those benefits anyway. Even better, competition in the student loan refinancing space means more companies are competing for your business now than ever before. From SoFi to CommonBond, the options are limitless. Also read this Earnest Review for details on their up-and-coming loan products. In a perfect world, everyone would follow their passion before landing their dream job in a well-respected and growing field. We would all have giant houses with picket fences, 2.5 healthy children, and two cars in the garage. And, of course, college would be free for anyone who could apply themselves long enough to finish. Sadly, we don’t live in that world, and the decisions we make have lifelong consequences. You’re stuck with whatever future you design…and the loans that accompany it. I plan to help my kids choose carefully and wisely with respect to where they hope to end up ten years down the road. I wish more people would do the same. What advice do you wish you received before reaching college age? Is there anything you wish you could change? PreviousWhat is My Net Worth? Is a College Degree Always Worth It? I don’t want to be a dream crusher either, but I’m having a great discussion with my three children about cost, career path, salary, etc. Spending some time doing so research before hand about the job market for a certain degree field will really help you later on. Unfortunately I don’t think many college bound students are do this. I didn’t get much advice when I went to college and kinda followed my passion, but it worked at for me, but understand that not the norm. if your daughter truly wants to be a veterinarian, I would fully support that only because they really are amazing. If you’re in a more rural area with expensive farm animals, you can do pretty well, especially if a vet is an expert with horses. The trick to things like super specialties though, like vets and dentists is you have to go far away from areas with your schools. I live in Philly where there are two dental schools, for instance, and so dentists aren’t as likely to make as much money due to competition from all the students in the area. I’m sure the veterinarian field is similar in that regard. Also, people can double-major! They can do the business degree plus the arts degree. It is more work and more time, but in some situations, having that double degree can really make a candidate stick out. My brother really feels that his electric engineering undergrad helped him get into a top tier law school (in addition to working hard on his LSAT). Having a unique background in a field full of people who are all the same can help out in one’s early stages of their career. Yeah, I’ll support her in whatever she wants to do – as long as it makes sense. I think becoming a veterinarian would be awesome for her! But that’s a fairly new idea. A few months ago, she wanted to design dresses and have her own dress shop =) I’m sure she’ll change her mind a gazillion times in the next 10-12 years! Thanks for sharing your trips! A double major sounds wise to me. If my son were to choose his dream career now, he’d be a garbage man! LOL! I know, right! Truth! These are great tips. For us, college was a “given”. My husband and I didn’t have a choice. I don’t regret going (I learned a ton, made awesome friends, and had a great time), but spending $150,000 on an education that I don’t use sometimes hurts (don’t worry, it wasn’t financed!). I will encourage my children to follow their passions, but also develop real world skills. If my kid is an amazing painter, I will encourage her to take art classes, and painting technique classes to hone her skill, but I want her to look further than an art career. Would she ever want to use her talent to each? Then teaching skills are also important to have. I think there is a fine balance between pursuing your passions and getting a job so you can make money. Honestly, seeing my husband in a job that he is good at but not passionate with I would rather have to go back to work so he could pursue his passions than live comfortably while he isn’t totally satisfied. Some colleges with fine art majors require students to take ed classes as well. They are just being realistic. I suggested my kids work for a couple years before starting college, and save like crazy. The scholarships were still out there when they arrived. Take on as much paid work as you can while in school. We could only help them a little towards their schooling, the rest was on them. They knew the numbers upfront and had to make pragmatic decisions from the start. It breaks my heart when kids I’ve seen as patients for years grow up, go to college, and major in Japanese studies or Geology. It would be tragic if my kid did that. If it were free, go ahead and major in whatever you want, but please don’t take out loans for a degree that’s only good for hanging on the wall. I 100% agree that you first need to do something that makes money so you can pursue your passions that may or may not generate income on the side. Otherwise, you’ll be a very well educated waiter or salesperson. Not sure why you’re picking on Geology. If you are truly interested in that subject, there are many (most) graduate programs that will pay you to get a Masters (or even PhD) degree, and there are many good jobs out there; from working for oil companies, private industry, or government work. I’m not making $1 million/year or anything (who is? ), but I got paid to get a Masters degree and I have a good job now, just 2 years out of school. Most fields within applied sciences, such as biology, engineering, earth sciences, etc., while competitive, are in high demand. ‘A degree in taking beach vacations’… haha. You would rock that! This is all great advice though for anyone who’s about to go to college. Even though writing is my passion, I have many other passions that I’d like to pursue but was wise enough not to actually study them in college. College is such a huge investment that you need to make sure you will get a return on it first and foremost. I went to the same private college my dad and granddad attended. It now costs over $200K for a degree from that same school, so there’s no way my child will be attending. I’m sorry, but I really blame the schools for a lot of the student debt crisis. They were the ones who decided to spend tons on upgrading facilities for climbing walls and a zillion services that are tangential to providing a good education, causing tuition to rise by 400-500% over where it was 25 year ago. Loan money was available and the schools took advantage of it to turn schools into spas and state of the art corporate campuses. The system cannot continue as is. Kids are going to have to settle for fewer amenities to keep costs reasonable, and most schools are going to have to find other ways to cut tuition to make it affordable. Kids are probably going to need to pick up a reasonably marketable minor or second major, and get some internships to make themselves reasonably marketable once they get out to pay their existing debt. The collective we of parents, students, and schools have to work together to fix a broken system that leaves folks broke, in debt, and unprepared for the actual jobs available, which often have nothing to do with most college degrees. My kids will not be doing 2 years of community college. That works best if they plan to transfer to a state school after, otherwise it can be a waste of time and money as not all courses will transfer. I teach at the flagship school in my state and am not impressed with the quality of education compared to other schools. My main concern is that they get a great education that challenges them and helps them grow as people. We can do that because we are upper middle class and value education. And my kids are extremely smart, and so far hardworking. And we’ve been putting away 500/mo/kid since birth. Your children won’t have to make those kind of sacrifices because you were wise enough to save so much money for their education. Sadly, that is not the case for the vast majority of future college students! My kids may or may not do the community college thing. It really depends on what their situation looks like when the time comes. At ages 4 and 6, it’s really too early to tell! Most parents aren’t in the 33% or higher tax bracket either. A lot of schools out there give pretty hefty need-based grants (not loans) to smart kids. Four year college is not usually as expensive as the sticker price. Community college is good advice for someone planning to go to a state school, especially if they can get credits during high school (which many high schools now allow), and it’s good advice for students who are on the margin of college attendance. 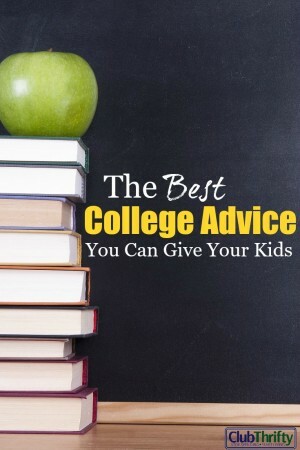 It’s also good advice for how to spend summers for kids who are at a four-year college but are missing required general education requirements to allow them to actually graduate in 4 years instead of 5 or more. Community college is bad advice for kids planning on transferring someplace where the credits don’t transfer, or for someone who could potentially get a full ride at a top rated private school. I agree with you, but most students aren’t in the running for a full ride at a top-rated school, either! It definitely makes sense to look at the situation and decide what will work best. Personally, I hope my kids attend a state school. We have some really awesome state schools nearby. And of course students get plenty of loans and grants depending on their income, but it’s obviously not enough when you look at how much people owe, on average. Sticker price doesn’t really matter when you’re walking away from school with $35,000+ in student loans. “Sadly, we’re often too busy telling our kids to “follow their dreams” to take a cold, hard look at the aftermath of following such advice.” SO TRUE! The great thing about “living” in the PF blogging world is that we have an education at our fingertips that is absolutely free. My kids are already being taught to follow their passion, to save to pay for it, to work on entrepreneurial skills and to stay out of debt! College or not, we’ll help them determine a career that will be both lucrative and satisfying. Love this Holly. So often we as parents don’t take an active role in truly helping kids think through their college decision and what that means now and for the future. Like you, we’re committed to going against the norm and helping to really prepare our kids as much as we can. Our 8 year old alternates between wanting to be “queen of the world” and the President – I don’t know which should concern me more, lol. Looking at education trends, Gen Z (the kids in college right now) are likely to be the most educated generation in American history, but education is not necessarily going to keep them afloat financially nor is it going always be worth the money. I certainly hope to teach my kids that if they want to do anything other than work at a fortune 500 company, in the medical field or as an engineer that a degree isn’t likely the right first step for them. Degrees aren’t bad, but they aren’t going to be differentiators in the near future (if they even are now). I would rather have my kids figure out what they want to do before they start jumping through hoops. Well, Stephanie at The Broke and Beautiful Life can teach some of those kids who follow their dreeeeaaammms. I feel like the first year of dorm life is an important socialization thing, but compared to the costs of community college, yeah, just skip it. I think the best advice is that what matters is the last college name on your resume. I had a friend who went to the University of Alaska, but that allowed her to become class president and otherwise stand out. She ended up in the school that is agreed to be the best in the field of diplomacy, and now she works for the Department of State. If your job is going to require an advanced degree (and most do these days), go to a cheap college and excel. Then get into a really good grad school. I feel that a lot of children these days are being forced by their parents to go to a college or university. Ok i wouldnt say forced but they are being pushed too. Not enough people are considering trade schools. Plumbers, electricians, carpenters, machinery; these are all excellent work fields that are always in high demand. The schooling for their certifications are much more affordable and these trades can easily earn 6 figures with the right amount of hard work. Too many students are in college today not even knowing what they want to do, they are just wasting money. Figure out your life pursuit, then pursue it! It makes me feel really old when I think about how much college cost when I went to school vs. what it is now. The price tags for a college education are so ridiculous now that you really have to have in-depth conversations with your kids and get strategic about an approach otherwise you are either wasting your own money or saddling your kid up with unnecessary debt that they will struggle to pay off for most of their adult life. The student loan bubble is certainly going to burst at some point. I think the community college option is absolutely the best way to go. We don’t have kids now but when we do I definitely want to pay for their college education in full. Waiting is obviously a wise choice for us because the longer we put off having kids the more debt we can pay down, investments we can make, and further along in our careers we can be. But being able to pay for our kids college tuition is definitely a motivating factor behind our choice to delay. We’re years off from this but someone very wise once suggested that you should never ask your child what ”job” they want to have, but rather ”what problem they want to solve”, which gets them thinking in a different manner in terms of what and how they can accomplish their goal. I wish I knew more about managing money in general. long story short I was never supposed to have loans, my grandparents had money for us in trust but it was essentially stolen from me in my senior year of high school. Scrambled, my mom and I went to the bank and got a student line of credit. The bank gave me $36,000 to pay for my 4 year undergrad but no one gave my and instructions on how to use it, or any of my money. There was absolutely a responsibility of mine as well but I wish I had know the power of budgeting and managing money! My dad gave similar advice about pursuing your dream. He wouldn’t help pay for college if I just did theatre, so I had to double major and thank God I did! There was a bit of door slamming at the time, but it was a great decision in retrospect. And I totally agree about community college. I also really wish more people would just consider trade/technical schools from the get-go because the traditional 4-year path and the resulting careers really aren’t right for everyone. Plus, lots of trade school jobs lead to nearly recession proof careers. Mike Rowe of dirty jobs even offers scholarships to people willing to go for jobs that require a skilled trade! Okay, rant over. Good for you! Unfortunately, I didn’t follow my parent’s advice (nor my professor’s) and ended up with only a theatre degree. My college experience was fantastic, but I should’ve listened to my mom and dad and earned a degree where I could make some fat stacks. The best advice I can is pick the right course that is very lucrative later on. My course is journalism but I am not practicing it. I wish I had chosen a course related to information technology or engineering because these courses are highly in demand. This was an excellent blog post! I would like to share my experience. I am 30 with no kids yet but this will be about what my parents did with me because my parents made a huge mistake and made me carry so many regrets. Straight out of high school I wanted to go to an affordable community college because I still had no idea what I wanted to do in life. Or even if college was for me. My parents forced me to go to a university and my aunt paid the registration fee. I couldn’t disrespect my parents and I was stuck going and I had to take out loans. The university made me come in with a major idea and tried to pressure me to hurry up and pick one. I had a lot of rough patches, failed a few classes that were just way too hard for me, and 3 times just wanted to quit. My parents threatened to kick me out if I left college so I changed my major from special education to criminal justice and it took me 8 years to get my bachelor’s. I could not get a job and desperately needed money so I was told that getting a masters in national security studies would immediately land me a job. Still could not even get an interview anywhere so I enrolled in the masters specializing in cyber security and lived off of the refund checks. Fast forward, I graduated may 2015, my program was one of the top national security programs in the country, and I interned with my state attorney general’s office. It is now 9 months later almost and no job, no interview, interest put me over $100k, and I’ve applied to at least 80-100 jobs all over the US. My parents talked down every career dream I had: special education, music therapy, dance teacher. I was told that none of those choices would make me successful. Now my parents see my situation and blame me saying “you have a mind of your own”. But you are raised to believe that your parents know better and are always looking out for your best interest. In my case, my parents failed me in the career department, other than that they were decent parents thats a huge reason why I trusted then. My reason for this comment is so other parents can hear my story and learn from it. Thank you for sharing, Tara. I think that’s the worst part – so many people follow their parent’s awful advice and live with the consequences for decades! And you’re so right; you think your parents know what is in your best interest – at least most people do. Sadly, that is not always the case. Thanks for posting your experience. As a parent with a son in college and one graduated, I know how tempting it is to micromanage your kid’s life. Most parents want to see their kids succeed AND love their work. At 18 most kids have no idea what they want to do. In today’s current job market, a career choice is really hard, unless you like the medical field. Our first born seemed to have a natural aptitude for computers and liked messing with them, so we strongly suggested he go into them. We also encouraged him to get advice from his computer geek uncle and others. College math sunk him. He switched majors to music marketing, and though he loved it, is now working at a grocery store. He found volunteer venues for his sound system skills, but nothing paid. We all had skin in the game, but didn’t want to be the parents who forced their kid to go to business school so they could make a “good” living, even though they hated it. Neither my husband or I went into particularly lucrative fields, but both of us have no regrets about our career choices. Loving your work was a priority for us in trying to guide our kids. As parents, we try to do the best with what info we have at the time. We don’t always do it right. Setting up realistic expectations early on with your kids is so important. I think the “running start” program is a great way to get an AA while kids are still in high school. Having two years under your belt not only allows you to get your education faster but really reduces the cost burden of college.